This spring's KCWC doesn't start till next week, but I'm getting inspired, so I whipped a t-shirt for D out tonight. All stash fabrics from the garage, pattern traced from a currently fitting shirt. I'm a little worried about how it'll hold up, as it's made from tissue thin jersey, and he has a GINORMOUS head, but hopefully it'll fit (we'll find out in the morning). I whipped this little egg cozy up last week as a gift for D's friend T. She's British. Egg coz us are British-y, right? Pattern from Debbie Birkin I knitted all the parts the night before the party, and then sewed them up while c drove us to the party... Hence the dashboard background. I read about this Eraser Clay on Remarkably Domestic, and my kiddos love those weird little erasers, so I thought this clay would be fun for them. I made this Peter Pan (with a pink feather, because red isn't an option) at D's request. You can see the crayons in the background for some idea of scale. he's quite small. clearly I need more practice, but he's pretty cute, if I do say so myself. haven't tested the erasing quality yet. but that's ok.
isn't he cute?!?!?! I totally faked it, so he's not perfect, but I'm pretty proud of him. D and I were looking for a "papa present" (usually a coffee mug) for him to give C for xmas, and found these penguin ornaments. he wanted. I balked at the price/weird eyes; so I knit (knitted?)! I knit him flat, with leftover yarn scraps, and then sewed him up the back... He measures like 3 inches tall/ maybe 4? clearly I need to go measure him sometime.... but not now. of course, the problem with having 2 kids is that when you make something for one of them, the other one wants one too. OH, and the kiddos are both insisting that THEIR penguin is named Penny, just like the penguin in the Magic Tree House books. I hate uncreative names, but there's no point in arguing. therefore, meet Penny and Penny, the penguins. both kids slept with them last night. it was totally cute. 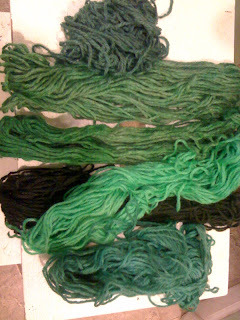 member these pretty little skeins? well, they were not wound and put away quickly enough! I discovered D, using them to "catch" aliens! and then I looked back, and the Bean had MORE! she's so pleased with herself! 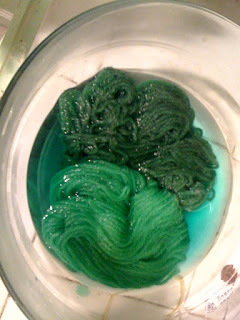 and here's another shot of the yarns I dyed last night, because they make me so happy. this makes me sooooo happy. 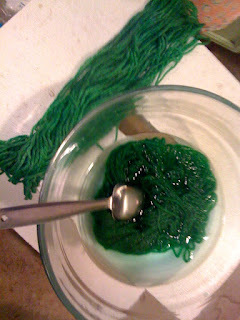 painting, sewing, dyeing, all sooooo fun! 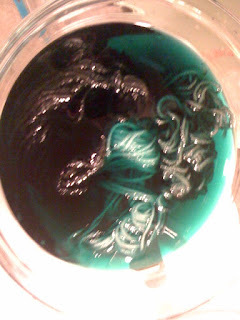 I did the vinegar/water bath for the time it took to watch project runway on tivo, then popped them in the dye baths and microwaved the heck outa them! don't you like my pretty greens! I'm soooo excited to play with more bits! these have to dry, then I'm going to make a block to see how accurate I was in my estimation.... 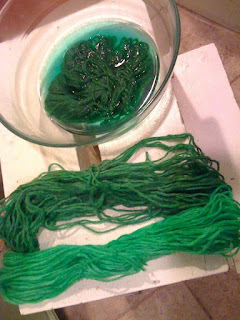 I'd like to have lots and lots of similar but different shades of greens, teals, and blues (NOT variegated, that's not the look I want for this afghan! ), so I'm carefully NOT recording the shades/recipes. I don't want to make them look the same. 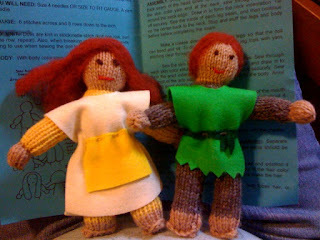 These are the dolls as they came out. The dude is supposed to have a brown hat with a leaf, but the kit doesn't have enough brown to do a full hat, so I'll have to find my brown felt tomorrow. I added feet-ish bottoms to their legs; I thought the legs in the pattern looked weirdly stumpy. I hate my faces, but overall am pleased with the finished products; hopefully D will love them. 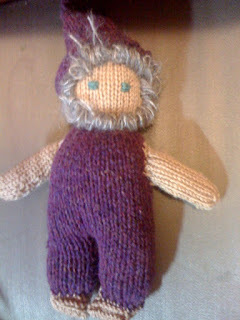 I also got this knitted dwarf kit (which I will be calling a gnome, b/c my son also loves a garden gnome down the street). My daughter just turned 1, and got lots of dolls. 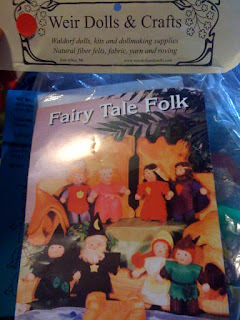 My son, of course, now wants to play dolls. I have NO problem with this, except that other people DO have problems with boys carrying around pink baby dolls and caring for them. I'm hoping this gnome gives him something to carry and love without being treated oddly. I love that he loves, and want to nurture that wonderful side of my little boy for as long as I possibly can. 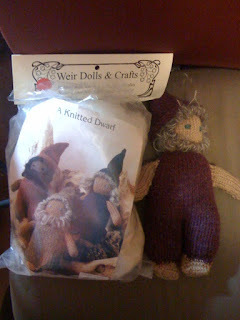 I have one more Weir doll to make, for the Bean this time (I've already made her a little cuddle doll that *goes* with the bigger doll, as yet unmade), and I have 4 kits from De Witte Engel that I'm going to cut out tomorrow. I wish I had more. SOOOOO amazingly beautiful/cute/wonderful.